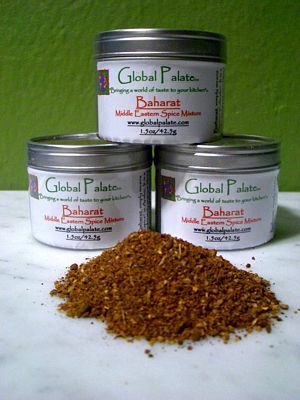 Baharat is "Spice" in the Arab world. It is an intoxicating blend of hot and sweet spices that is the Middle Eastern version of a curry blend but with a milder more fragrant aroma . It is frequently added to soups and stews for an added depth of flavor. It is also made into a paste by combining it with garlic, herbs and olive oil and rubbed on meat before grilling . I love to use it in the recipes below for a different twist. 1 free range organic chicken, cut up in to legs, thighs, wings and breasts. In the bowl of a small food processor, combine the garlic, Global Palate Baharat, salt and flat leaf parsley. Pulse the processor to puree the ingredients. With the motor running slowly add the olive oil until the mixture forms a loose paste. Cut each of the chicken breast halves in half again if they are large and place into a large non-reactive mixing bowl with the rest of the chicken pieces. Pour the spice puree over the meat and using your hands coat each piece thoroughly with the mixture. Allow the chicken to marinate for at least an hour or up to 8 hrs in the refrigerator. Preheat the oven to 450 degrees F. Arrange the marinated pieces of chicken in a large shallow roasting pan or heavy baking sheet and top with the chopped onion and fennel. Arrange the fingerling potatoes around the chicken and press them lightly down into the sheet. Sprinkle a bit more salt over all and then evenly squeeze a lemon over the entire pan through a small strainer to avoid the seeds. Place the pan into the oven and roast for about 1 hour, turning the chicken pieces and stirring the vegetables around until the juices run clear when a thigh is pierced by the tip of a knife. Remove from the oven and let rest 10 min then transfer to a serving platter and garnish with a bit more chopped parsley. Serve with Saffron Rice Pilaf.